To view your statement history, click "All statements. " You will be able to access up to five years of your account history, no matter where you are. Let E-Statements help you to easily stay up-to-date with your account activity and view all your statements online, with just a few clicks. *It may take up to 30 days to stop receiving paper statements. 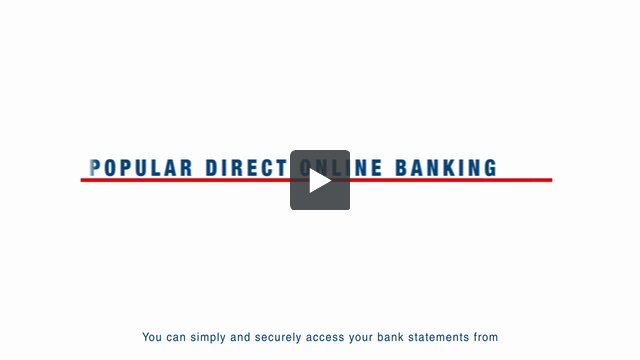 Get safe and secure access to your bank statements anytime, anywhere with E-Statements from Popular Direct Online Banking. The information mentioned in this article is for informational purposes only, is intended to provide general guidance and does not constitute legal or tax advice. Each person's situation is unique and may materially differ from the information provided herein. You should seek the advice of a financial professional, tax consultant and/or legal counsel to address your specific needs before any financial or other commitments regarding the issues related to your situation are made. Popular Bank does not make any representations or warranties as to the content contained herein and disclaims any and all liability resulting from any use of or reliance on such content.